China’s unprecedented urbanization is underpinned by not only massive rural-urban migration but also a household registration system embedded in a territorial hierarchy that produces lingering urban-rural duality. The mid-1990s onwards witnessed increasing reliance on land revenues by municipal governments, causing repeated redrawing of city boundaries to incorporate surrounding countryside. The identification of real estate as a growth anchor further fueled urban expansion. Sprawling commodity housing estates proliferate on urban-rural fringes, juxtaposed with historical villages undergoing intense densification. The traditional urban core and work-unit compounds also undergo wholesale redevelopment. Alongside large influx of migrants, major reshuffling of population has taken place inside metropolitan areas. Chinese cities today are more differentiated than ever, with new communities superimposing and superseding older ones. The rise of the urban middle class, in particular, has facilitated the formation of homeowners’ associations, and poses major challenges to hitherto state dominated local governance. The present volume tries to more deeply unravel and delineate the intertwining forms and processes outlined above from a variety of angles: circulatory, mobility and precariousness; urbanization, diversity and segregation; and community and local governance. 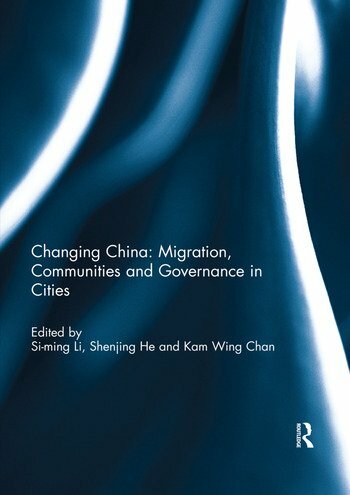 Contributors include scholars of Chinese cities from mainland China, Hong Kong, Canada, Australia and the United States. This volume was previously published as a special issue of Eurasian Geography and Economics. Si-ming Li is currently Director of David C Lam Institute of East-West Studies and Chair Professor of Geography, Hong Kong Baptist University. Shenjing He is an Associate Professor at the department of Urban Planning and Design, The University of Hong Kong. Kam Wing Chan is Professor of Geography at the University of Washington.